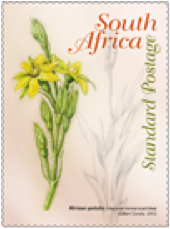 Commercial and Medicinal Plants Goodness from Mother Earth, a new stamp release by the South African Post Office for the 15th May 2012. 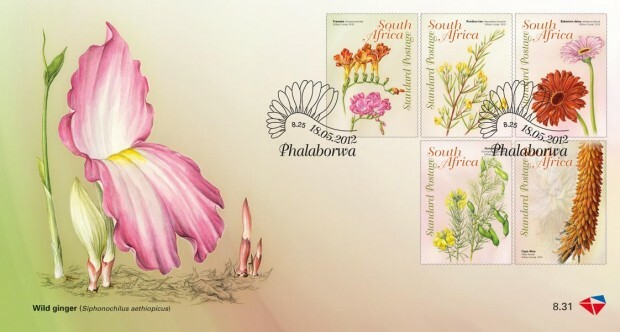 It is a beautifully designed set with two first day covers as well as a sheet of 10 stamps. Botanical artist Gillian Condy illustrated the plants. Instead of using photographs, Gillian works only from the actual plants using “scientific lighting”, which means the light source comes from the upper left hand side of the object. 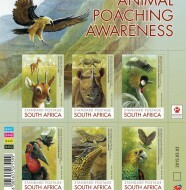 South Africa, with its remarkable variety of plants, is considered a world “hotspot” for biodiversity. The more than 22 000 species occurring within its borders, presents 10% of the world’s species although the land surface covers less than 1% of the earth. Many of these plants are used for medicinal purposes, as well as for beauty products and in the food industry. 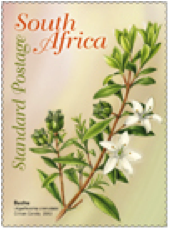 A set of 10 stamps to be issued on 18 May 2012, highlights some of South Africa’s commercial and medicinal plants. 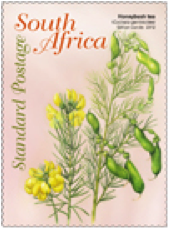 In South Africa, plants have been used extensively for medicinal purposes for many centuries. 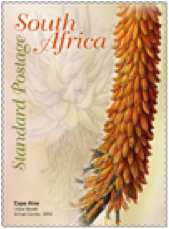 Several of these such as buchu, aloe, devil’s claw, the African potato and wild ginger are still used in traditional medicine and as home remedies or “Boererate” as they are known in Afrikaans. Many modern medicines were developed from plants used for traditional medicine; in fact, plants and their derivatives contribute to more than 50% of all medicines used worldwide. 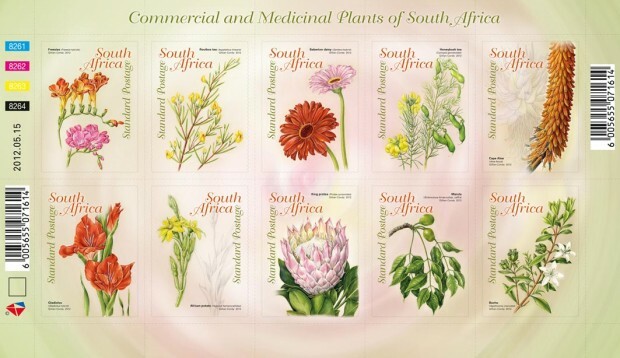 The medicinal, commercial and ornamental plants featured on the stamps were identified in conjunction with the Agricultural Research Council (ARC) at Roodeplaat near Pretoria. Only the leaves and roots of the buchu plant are used for medicinal purposes, usually for the treatment of kidney and urinary tract diseases. It is also applied locally to bruises and rheumatic pains. The leaves can also be chewed to relieve stomach complaints and infusions are used against fever, fatigue, congestion of the chest, and to strengthen the body. Fresh juice made from its leaves is used in the treatment of conjunctivitis. Powder ground from charred leaves is applied to venereal sores, while ground leaves can be used for snuff. Bitter aloe is traditionally used in the treatment of arthritis, eczema and hypertension. It is also applied externally to treat skin irritations, burns and bruises. 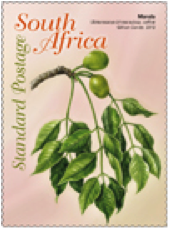 The African potato or inkomfe in Zulu, is widely used in traditional African medicine. Also known as the starflower, it is a tuberous perennial with strap like leaves and yellow star shaped flowers. The tuberous rootstock or corm is the part mostly used for its medicinal properties. Infusions of the corm are used to treat nausea and bladder disorders. The rootstock of the wild ginger smells and tastes like ginger and is mainly used for colds and flu. The plant has fragrant flowers and a bunch of leaves, which develop during or after flowering. The flowers last for only one day, but the plant can bring forth up to 25 flowers from October to November. Devil’s claw is a bitter, astringent sedative and painkilling herb that reduces inflammation and stimulates the digestive system. Internally, devil’s claw is used to treat rheumatoid arthritis, neuralgia and ailments involving the gall bladder and pancreas, lower back pain, digestive problems, and loss of appetite, as well as for pain during and after childbirth. It is also used externally to treat swollen joints, boils, sores and skin ulcers. 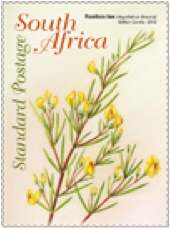 The rooibos tea plant grows only in the Cederberg area of South Africa, some 250 km north of Cape Town. It is an excellent source of antioxidants and the only known source of a potent antioxidant aspalathin, which could play a role in combating several lifestyle diseases. It contains low amounts of tannin and has proven cancer fighting properties. Rooibos is naturally caffeine free and suitable for children, infants and breast feeding mothers. Honeybush is a herbal tea from the Cyclopia plant, which grows in the high mountains of the Western and Eastern Cape regions as part of South Africa’s unique fynbos biome. It is caffeine free, has very low tannin levels and calms the central nervous system. Honeybush is similar in appearance and taste to rooibos, but is naturally sweeter. Described as one of Africa’s botanical treasures, the marula, Scelerocarya birrea, subspecies caffera, has been used for thousands of years. 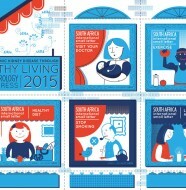 Archaeological evidence shows that it was a source of nutrition in Southern Africa as long ago as 10 000 years B.C. 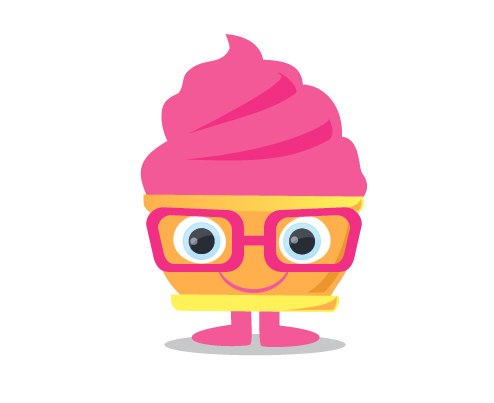 Multiple uses for the bark, leaves, fruit, nut and kernels have been recorded. The marula tree grows abundantly in South Africa’s Limpopo, KwaZulu Natal, Eastern Cape and Mpumalanga provinces. Freesias belong to the large and very diverse Iridaceae, a family of about 65 genera and 1 800 species distributed all over the world. Africa south of the Equator is home to the greatest concentration of species; 46 genera occur here, including many well known ornamentals. With its showy white spring flowers, exquisite perfume and relative ease in cultivation, Freesia alba is one of the most popular bulbs to grow. This beautiful daisy, locally known as the Barberton daisy, occurs naturally in the Barberton area of Mpumalanga in sandy, well drained soils. It is a popular garden plant throughout the world and is one of the parents of the many showy Gerbera hybrids seen in florist shops. 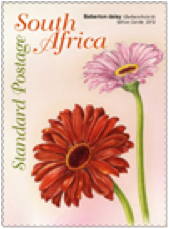 Gerbera jamesonii is a perennial herb with deeply lobed leaves covered with silky hairs. The outermost petals may be cream, red, orange or pink, while the central flowers are cream. Gladioli are renowned for their striking, colourful flowers and are popular garden plants. 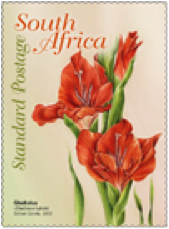 They have been cultivated in Europe for more than 250 years, but were originally grown from hybrids of wild gladioli native to South Africa. Roots, leaves and flowers develop from an underground corm, which is a swollen part of the stem serving as a storage organ when the plant dies back during winter. Leaves are long and narrow, and resemble the shape of a sword. 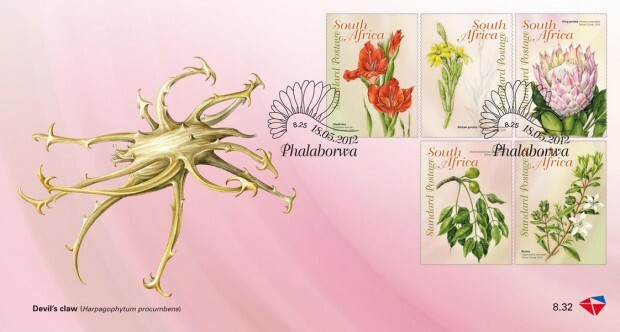 The protea is the flagship species of the Cape Floral Kingdom. A typical example of fynbos vegetation, the protea is a shrub with broad leaves and blooms that range from flame red and bright pink to soft pink and peach. 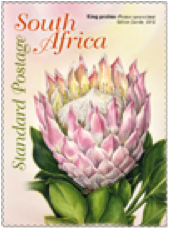 Proteas are from the genus Protea, which has more than 92 species, subspecies and varieties. The spectacular king protea, which can measure up to 30 cm across, is South Africa’s national flower. 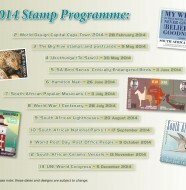 These stamps will once again be very popular with theme collectors so best you make a note of the date and get to your nearest post office to ensure you get your stamps. 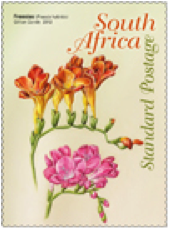 One Comment on "Commercial and Medicinal Plants – SAPO new stamp release"